There are thousands of languages out there, and (nearly) every one of them are uniquely different to each other. However, despite their numerous differences, there is one thing that is common across all the languages of the world, and that’s the rules of grammar. And why shouldn’t it be? After all, a language (both when spoken or written) is only deemed proper, if it adheres to the rules of its grammar. Now, English is the one language that’s spoken and understood worldwide. But even after that, learning its grammatical rules can be quite a daunting affair. Fret not, as Road To Grammar is there to help you with that. 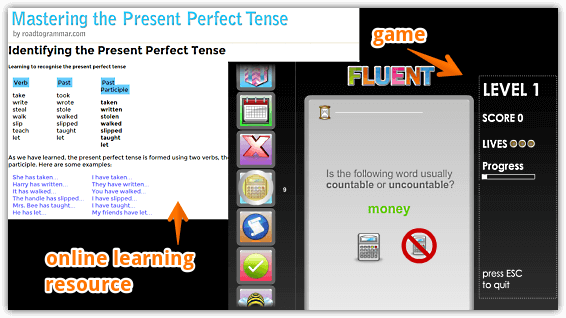 It’s an incredible online service that lets you learn English grammar with interactive resources. Road To Grammar consists of a plethora of cool stuff, such as quizzes and notes for learning grammatical elements like adverbs and interjections. And that’s just the beginning. There are online modules for teaching yourself tenses, idioms, household item names, and even weather vocabulary. 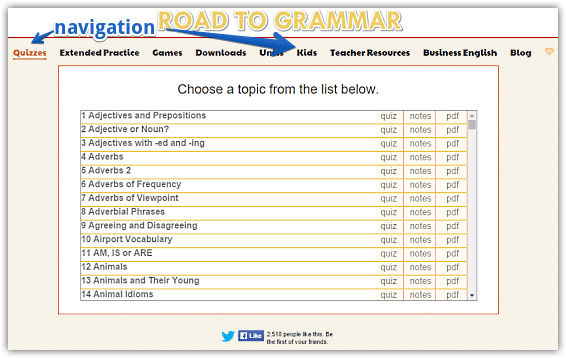 Road To Grammar also consists of downloadable handouts for teachers, online games, and much more. How To Learn English Grammar With Interactive Resources? As seen above, the UI is fairly simple and incredibly easy to navigate. The header bar consists of links for accessing the resources that Road To Grammar has. These include everything from Quizzes to Games, and from Teacher Resources to Downloadable Content. The default landing section lists quiz/notes for starter topics such as adverbs, idioms etc., and you can click on one to view the information associated with it. Knowing the rules of grammar is a central aspect of mastering not just English, but just about any language out there. And thanks to incredible resources like Road To Grammar, you can learn everything about the rules of English grammar, without spending anything. Give it a try, you’ll be glad you did.